This information is strictly confidential and is used solely by Select Solar LLC for contacting customers that have requested information. We guarantee that your privacy and information are secure, no information is stored on our website. 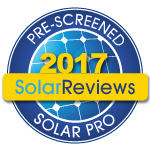 Free Select Solar Site Survey for potential Solar Electric System installation at your home or business. We will contact you as soon as possible when you submit a request, usually within 24 hours.